Chives are a perennial herb found throughout the world. They are a very versatile herb that can be grown in herb garden beds, in patio containers and flower pots. This popular herb is a member of the lily family. Growing chives is very easy to do. These tips will show you how to plant, grow and harvest this tasty herb. The hollow, green smooth textured leaves have a taste that is similar to both leeks and onions. Chives are a cut and grow again herb, which will re-grow after you cut the leaves off for use. There are many types of the allium family. Chives are one of them. Find out about the onion varieties here. 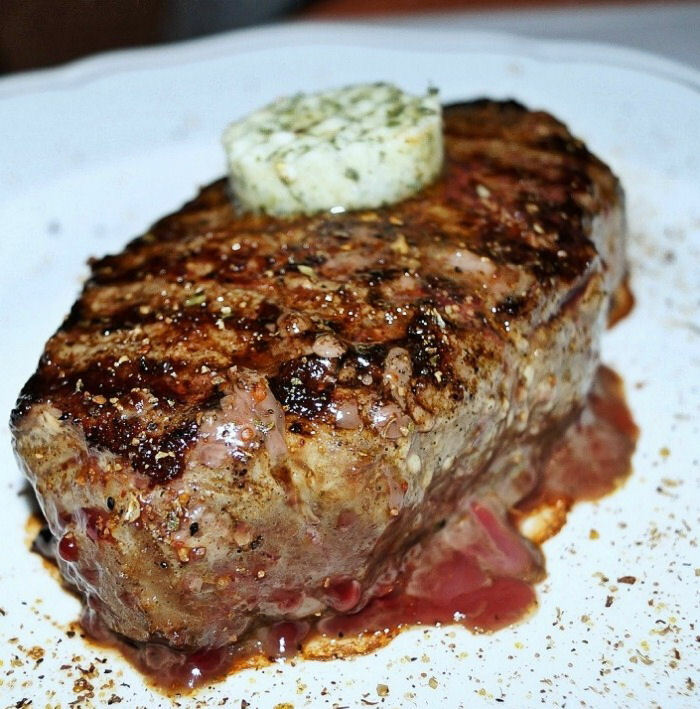 Who doesn’t like the light oniony taste of fresh chives as a garnish, or some chive butter on top of a grilled steak? Growing chives is a way to get both! Tips for Growing Chives – How to plant, grow and harvest fresh chives. Chives like ample sunlight and consistent watering. They are an often used herb for kitchen gardens and are easy to take care of. Here are some tips to get the most out of this fresh herb. Growing chives is easy. Place them in full sun outdoors. If you grow them in pots inside, place them on a sunny window sill that faces south if you can. In the hottest climates, chives will grow in a semi sunny or partial shade spot. I like to grow chives in a garden on my deck where they are handy to cut when I need to use them. Plant chives about 8-12 inches apart. Grow in well draining soil that has been amended with lots of compost. Ideal soil pH is 6.0 to 7.0. Even though chives will grow in less than the best soil, they won’t grow as fast, so organic matter is necessary for optimum growth. The plants can grow to 12 to 24 inches tall and may spread to about a foot across. 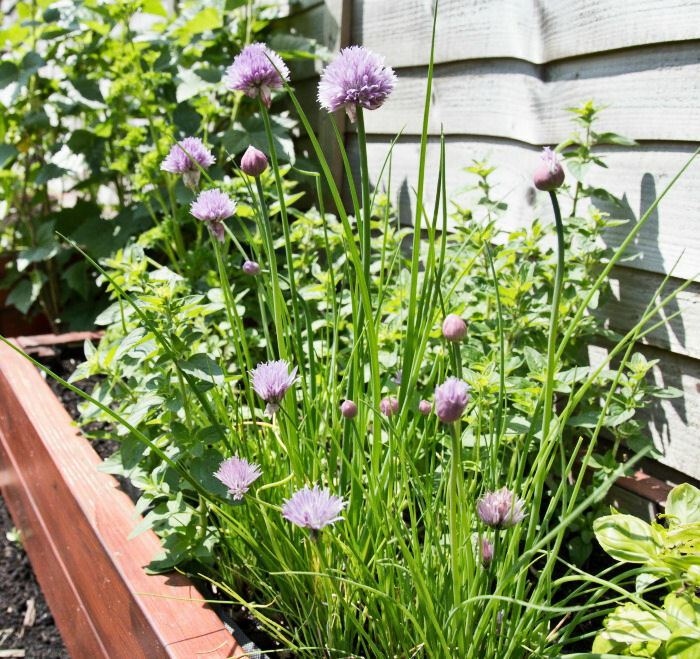 Growing chives as companion plants for carrots, cabbage and tomatoes is beneficial since the plant can help to flavor carrots and will also repel aphids. 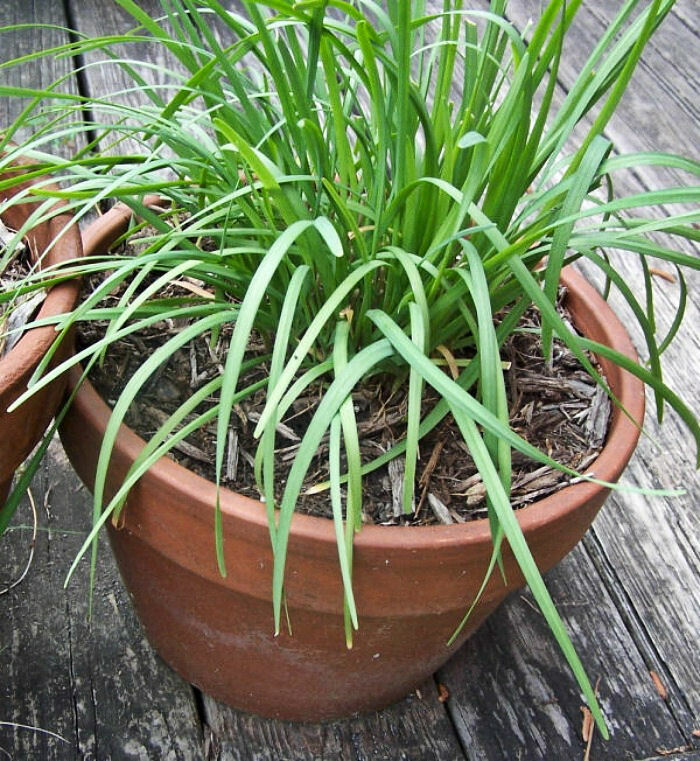 If you grow chives in garden pots be sure to give the roots room to grow, since they will spread out as they mature. Give chives consistent watering throughout the growing season to get the highest yields. Moisten the soil thoroughly when watering and allow it to drain well if the plants are grown in pots. 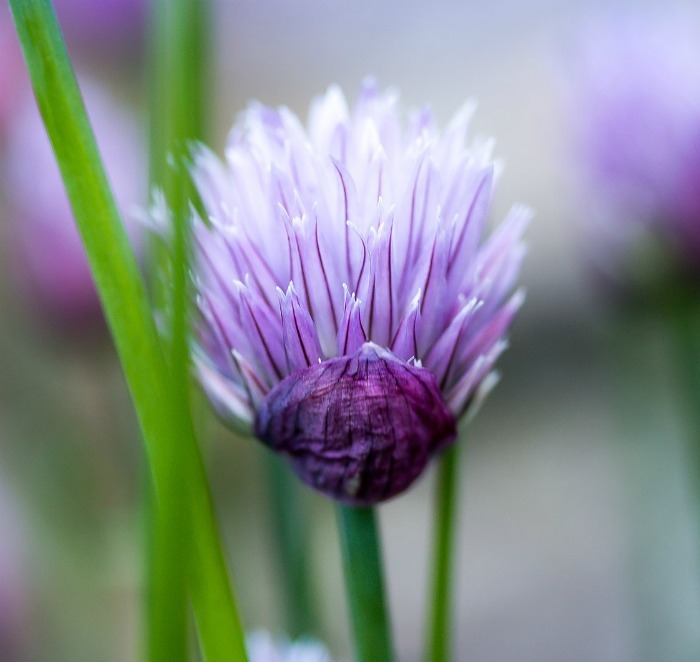 Chives produce delicate purple flowers but it is best to pinch them off unless you are using the plant solely as a border plant. The plant will produce more leaves if the flowers are not allowed to develop. Since they have such pretty flowers, they are a nice candidate to be used in a garden of both vegetables and perennials. 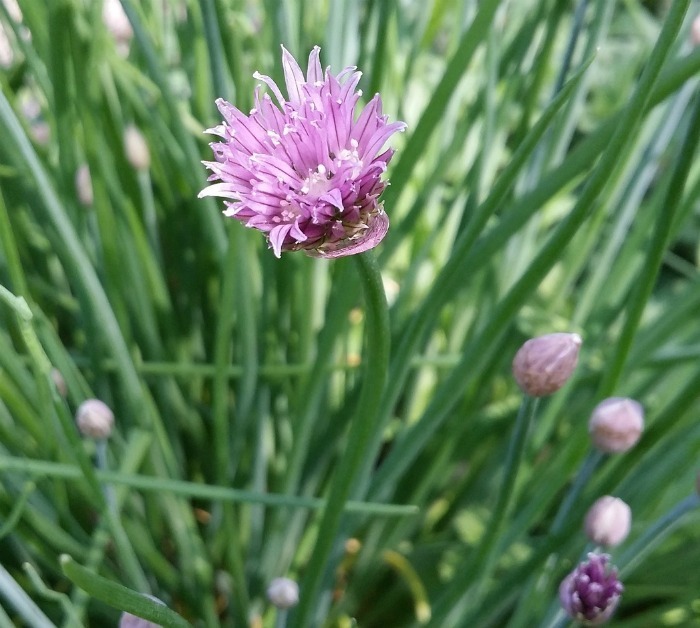 The delicate flowers of chives are edible and can also be used as a garnish. To use the flower heads, pull them apart and use the tiny petals sprinkled on food. They add a delicate onion like flavor to soups and creamy sauces. The appearance of chives is similar to that of liriope. They have long green leaves with flowers that appear above the plant. 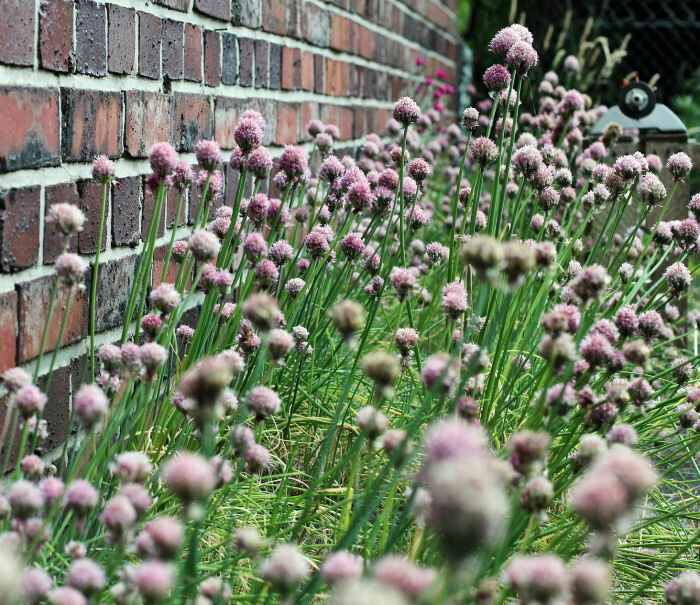 Try growing chives as a border plant. Their growth habit looks very pretty along the edges of any garden bed. Many chive leaves are hollow. The leaves grow in one long stem which is cut and then snipped into small pieces for use in recipes. Garlic chives have a garlic like flavor, and broad flat leaves (not hollow) with white flowers. Chives are a hardy cold weather perennial that grows in conditions similar to onions. They are ever green in warm winter regions. They will die back in the colder zones but will come back again in spring. They are a perennial herb in zones 3-10. 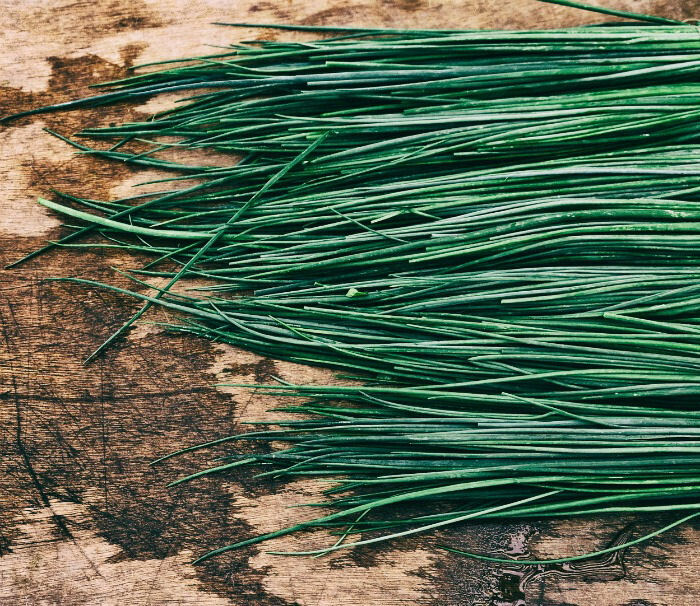 It is best to harvest chives before they flower, since the herb will lose much of it’s flavor once the plant flowers. Chives are best used fresh in recipes, since their flavor is almost completely lost when the herb is dried. If you have more than you need, you can freeze chives in oil or butter into cubes to use later. The herb is relatively fast growing. Chives will mature about 30 days after you transplant them or about 60 days after starting from seeds. You can start harvesting chives as soon as the leaves are big enough to clip and use in recipes. Just cut to about 1/2 inch above the soil level. I clip mine from the outside of the plant. They will regrow around the cut areas. Be sure to leave some of the leaf since the plant needs this to ensure future growth. If you do happen to cut it all the way to the ground, it may not grow back this year but should return next. Chives are generally avoided by critters and insects because of their onion like flavor, but aphids do sometimes go for them, particularly in early spring when the shoots are new and tender. They can be treated with Neem oil. Later, chives actually repel aphids. Root rot can be a problem with plants that have been over-watered and spider mites and mealy bugs can affect those grown indoors. Growing chives from seed is easy enough but they will take about a year for form a large enough clump to use for recipes. You can start the seeds indoors about 8 weeks before the last spring frost to get a head start on spring. Use peat pots or standard pots, or make your own handy seed starting pots. For a faster crop purchase the plant as seedlings. Since chives comes back year after year, the roots will grow into clumps of smaller plants in a few years. You can divide them in early spring to give you more plants for free. Fresh chives are often used in egg, cheese and fish dishes, and are also great with potatoes. 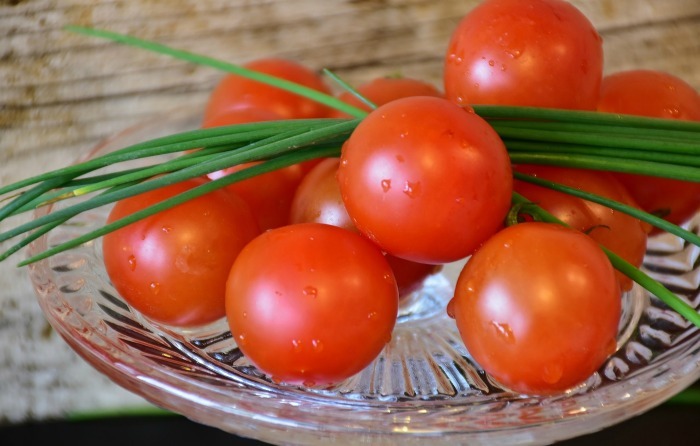 I use them as a garnish on just about anything that has a dollop of sour cream and they are really nice as a garnish for tomatoes. Chive butter is really easy to make. It’s a great way to use extra herbs so that they can be used later. You can also use chives to make chive butter. It is really easy to make and tastes delicious as a topping. I love it on a piece of steak fresh from the grill! 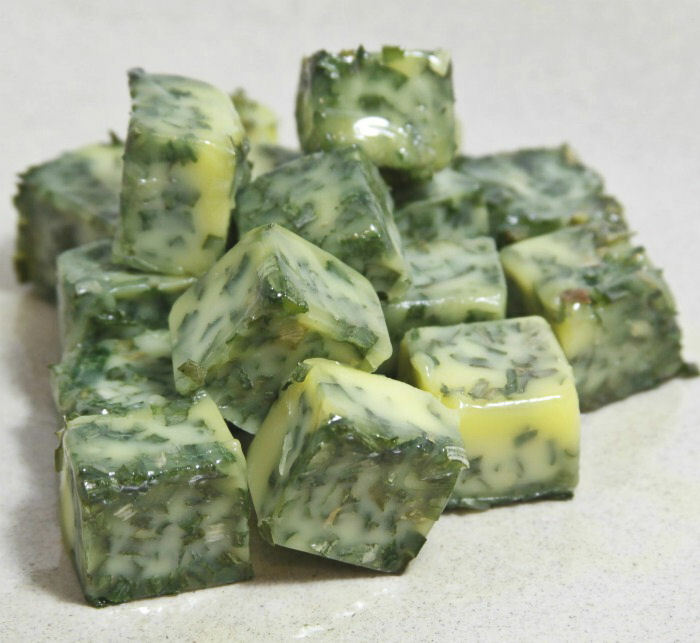 Chive butter is great on crackers and home made crudites, and very tasty used on meat, fish and vegetables. The recipe is on the card below. Your site is making me weep for joy. Your posts are so informative and thorough. I absolutely love everything I read. So useful and we head toward self-sufficiency. Thank you so much for the kind comment. It was a pleasure for me to read.